Killer Characters: WHAT'S A GIRL TO DO? with BOOKS CAN BE DECEIVING! at pairing a person with the perfect book. dramatic understatement for what she was feeling. bay, we found him in his studio...dead. And not just dead, but murdered. level best to prove me innocent. But what if she can't? What if I'm put in jail for a crime I didn't commit? What would you do? Stay and declare your innocence or run? Don't run, Beth! You need to stay and keep protesting that you're innocent. I'm sure Lindsey will find the truth. I'm really looking forward to reading this new series. Sounds intriguing! I agree with Erika. If you run, you'll look guilty. Stay and help Lindsey find out who killed Rick. Don't run! You and Lindsey can find the real killer if you put your heads together. One librarian is mighty powerful - two are unstoppable. 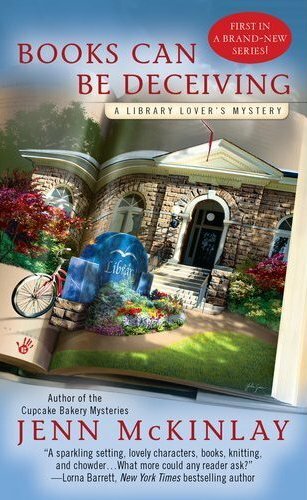 As an elementary school librarian who loves mysteries, I'm really looking forward to this series. I can hardly wait! Stay! Running is a decision you will regret for the rest of your life! Stay and fight. You've got friends. So the decision is to stay. Okay, I'll try. I'll be right there with LIndsey help her catch that killer and righting a wrong with regards to your book. How frightening, Beth. You need to stay and defend yourself and your work. And wow, I can't wait to read about how it all turns out! This sounds like a fun new series. I look forward to reading this first book. Now I just need to preorder the book.